I really like this spread, I love the colours. The gesso base was very textured and it has loads of layers of acrylic paint on it, I think it changed colour about three or four times! I found some great scrap book paper in purple with vintage hand writing on it and also a scrap of paper that came with some ephemera from K & Co. 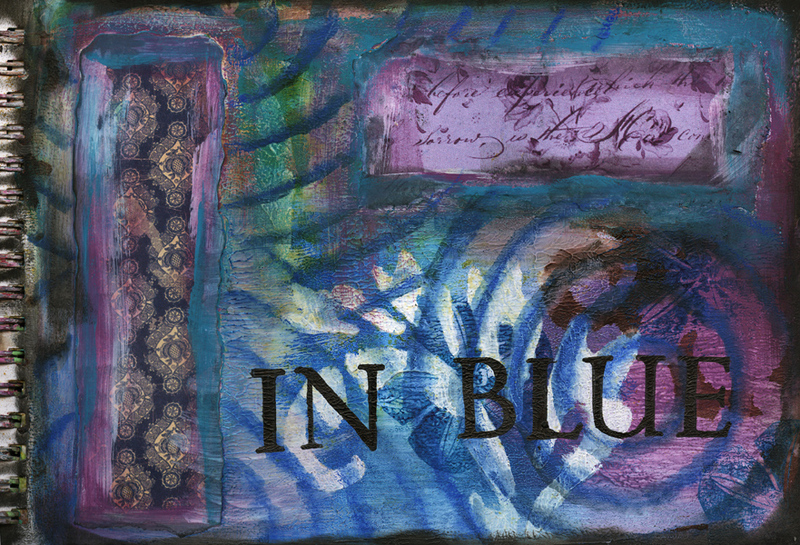 I think there is some Adirondak Colorwash spray where I put a wet stencil in the journal and I also stenciled (through my paper cut stencil) with some gesso to lighten the page, I used a flower stamp and blue ink to stamp over the top and then I drew swirls in dark blue Inktense pencil. I am really pleased with the result. I think I have said before that I am much more a visual person than an auditory one, but my husband is the other way around, and all through our time together (over 40 years!!!) I have heard lots of great music. Tangled Up in Blue is a song by Bob Dylan from the album Blood on the Tracks released in 1975, it was/is a great album and I was 20 years old when I first heard it. It still sounds good today. 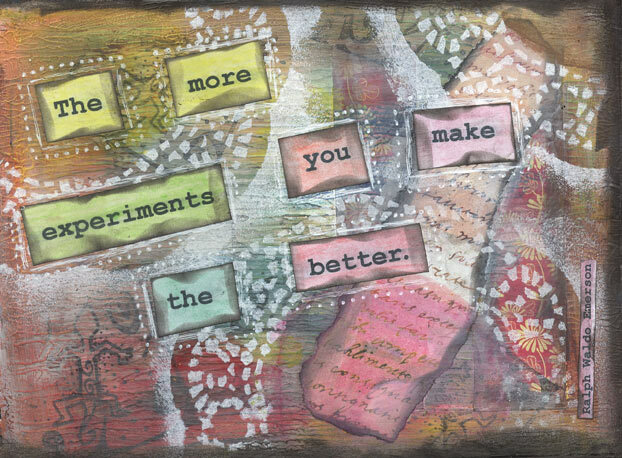 I am having a great time over at 21 Secrets, I am doing two workshops at the moment: one is Gretchen Miller’s Ready for Revo-ution which is about creating a book/journal about the changes you want to make or about the things you want to attract into your life. Gretchen very kindly posted my second page, about Living Life Fearlessly, on her blog Creativity in Motion. I am also doing Jane Davenport’s Draw Happy workshop. I am pretty useless at drawing, but this workshop is at least encouraging me to have a go, and I’m sure the more I practice the easier it will become. 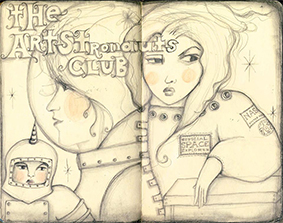 I hope I have time to do a few more workshops before 21 Secrets closes at the end of the year. I just can’t tell you how inspiring and what fun it all is. 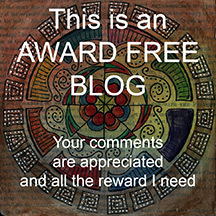 OK now I have a question, does anyone know how to add a badge to the side bar of a wordpress page? I’m so dense I just can’t figure it out! I’d really like to put the 21 Secret’s badge on my sidebar (and a few others too). If anyone could give me a clue, I’d be ever so grateful. I’ve been so busy lately and apologise for not responding to comments, I’ll rectify that soon I hope, I’ve just been soooooo busy. You know going to work is such a huge inconvenience in my life, but it pays the mortgage so I shouldn’t really complain. I am getting immersed in 21 Secrets and it’s fabulous – I feel like a kid in a sweet shop, there’s so much to choose from – it’s awesome 🙂 As soon as I can figure out how to put the badge on my blog I will do so, but for the time being it has me baffled. I’m such a dunce sometimes. Anyway this spread is a bit weird, visually I don’t really like it, it didn’t come out as I wanted, but nevertheless it has a deep personal significance to me. The phrase is from a song by Yello. The reason it is so important to me is that my husband has bipolar disorder (also known as manic depression) and there have been times when he has been very, very unwell. Fortunately for the past few years, thanks to finally finding the right medication, things have been under control, he is not cured but things are so much better now. When he was very ill there were times when I felt I was losing him but if I asked him that question it was kind of grounding for both of us. 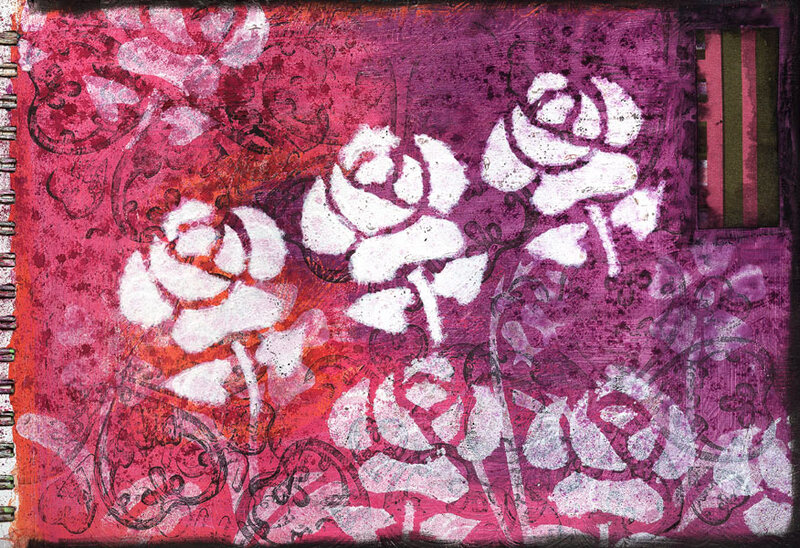 The answer to the question is always ‘The Three Roses’. I’ve no idea what it means in terms of the song, and we have never been to a place called The Three Roses. Saying it can’t fix anything, but it’s a connection we can make through the mire of depression or craziness, or whatever. Next to saying ‘I love you’ it’s probably the most important thing we can say to eachother. Oh my gosh, I am so happy that I will be taking part on the 21 Secrets online workshops. I think I’m going to learn such a lot from all those great teachers. Thank you Carolyn of A Colorful Journey for giving me this wonderful opportunity, I can’t wait to get started. In honour of this day I took down the Cheshire Cat, that lives on top of my wardrobe, to share with you. 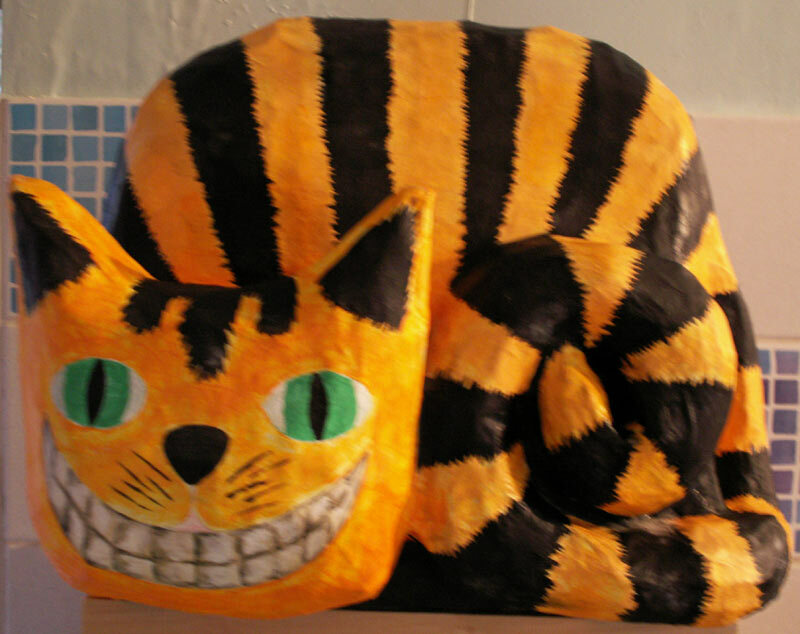 I made him out of papier mache a long time ago and we are both grinning from ear to ear. I really like this spread, I used masking tape on the pages, painted over the whole page with acrylics and gesso then removed the tape and added more in different places then painted over again with paint and gesso and kept on repeating. There was also a lot of wiping back with baby wipes and I love the overall effect. Most of the images are from the wonderful Graphics Fairy blog, so thank you Karen – you are very generous, inspiring and have so many fantastic images. As soon as I saw the image of the beehive and the lady with the binoculars I knew I had to use them in a piece of art. 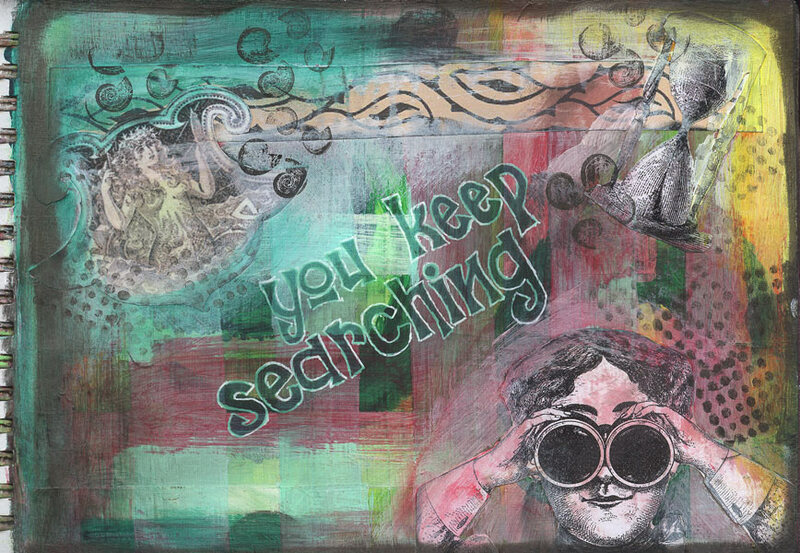 It seems to me the lady is searching for something so I found an appropriate quote (based on a quote by Joan Baez). I try to live my life by searching always for ways to be better but also for being more content with who I am, if that makes sense. Being creative certainly helps. I found a sweet set of rubber stamps and I love the little shells. Anyway I’ve had a very odd week, felt totally shattered after the successful Heritage Event. I had to go back to work on Monday and it took the small team two days (and me two evenings) to get all the bunting down, the displays packed away and everything tidy again in the Heritage Centre. Then having got all the boxes and stuff back to our various homes we all had to store it away. One day we will, hopefully, have somewhere permanent to keep our growing archive of research, artefacts and display materails, but for the time being it all takes up room in several houses. The more we get the heavier it is to keep moving about, and none of us are as young or as fit as we’d like to be! Back at work we received the results of an employee opinion survey carried out some time ago by an external company. The results showed that the vast majority of staff don’t feel valued by the company. This seems to have come as a great surprise to our directors and senior management but was exactly what we all thought. Fortunately the top bods have decided to try and improve things for us and I volunteered to sit on one of the focus groups to discuss how to go about this. Most of my colleagues are very sceptical that there will be any improvements, but I figure we have nothing to lose by being involved and trying. Also I am hoping it will give me a bit more visibility and confidence. I really need to build my confidence at work. I always thought I was capable of more than I was given credit for, but this week I made two very stupid mistakes – one was a miscalculation which gave the wrong results in a report and the other was a duplication of an order (although that one wasn’t entirely my fault). It seriously made me wonder if I’m losing brain capacity and I’m not as sharp as I like to think I am, I actually got quite upset and emotional about it. Then I came home and did some art and that made me feel much better and determined to keep on searching and improving. I love this quote from Ralph Waldo Emerson and yesterday I used it to make myself do something that I wouldn’t normally have done. I think I have said before that I never wanted to be in the spotlight. When I was younger I was always uncomfortable doing something if there was an audience. As a young child I learnt to play the piano and I was quite good at it, but as soon as there an audience I fell apart. There was this loud voice inside my head telling me I couldn’t do it, and so of course, naturally I couldn’t. The final straw came when my music teacher entered me into a local music festival playing in a trio. It was a total disaster and when the piece was finished (I think I was at least two bars behind the other two at the end) my two partners hated me for messing it up and I never played the piano again. After that I never wanted to do anything that put me up front with people looking at me. And that attitude governed my life for many years, I just wanted to do things in the background and be unnoticed. Fast forward many years and with a small group of friends I set up the local history group, it was a great success. Then something happened and the chairman resigned suddenly and unexpectedly and the group was in serious danger of folding. The only way to save it was for me to step up and take the lead. At very short notice I had to stand up and talk in front of a packed room of people to tell them what had happened. I was shaking and my voice was breaking up, but I did it. Ever since then year after year I have been voted chairman of the group and I am now much more comfortable speaking to large groups of people. Yesterday we held an event in the Heritage Centre in our local cemetery, we had exhibitions of historical interest, research folders, an historic tableau with a sea-side theme and lots more. I know lots of information about the people buried in the cemetery and I have become used to leading groups around and talking to them about the people and the part they played in the history of the town. Yesterday we tried something different, we had a ‘Meet the Residents’ character walk. This meant that one of our members led the group of people around and gave some background information. Then as they came to interesting graves they met a ‘character’ in costume who told their story. I was Mrs Cradock a wealthy socialite and prominent person in the town. We had had no time for rehearsing or even learning our scripts and all of us were nervous and worried about doing it. I am so glad we did it though, we had such a lot of fun. It turns out we are all quite good actors, it was comical and informative and the audience enjoyed it. We are doing it again today! 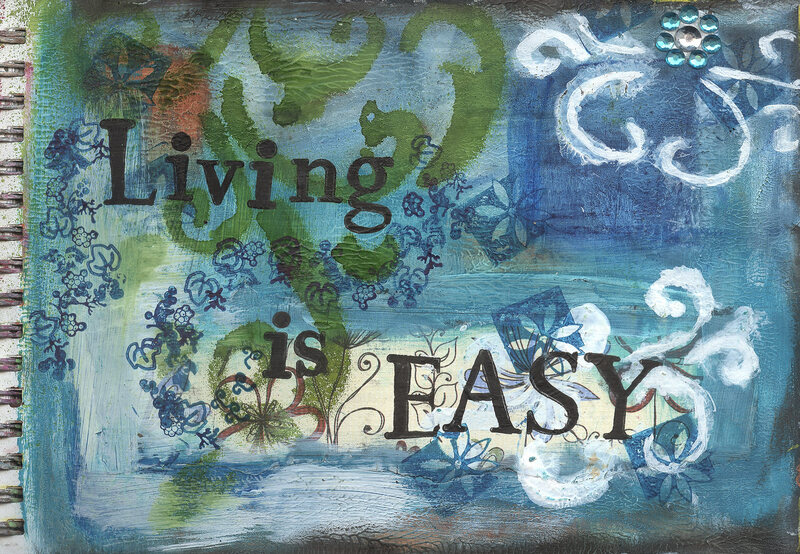 So anyway, the spread above has lots of layers of paper, stamping and acrylic paints, it was getting very dark and grungey looking so I decided to lighten it by gessoing through a paper doiley over the top and then I added the wonderful quote from Ralph Waldo Emerson. Summer time – where did it go? I haven’t really got much to say about this spread except that I was happy with the outcome. 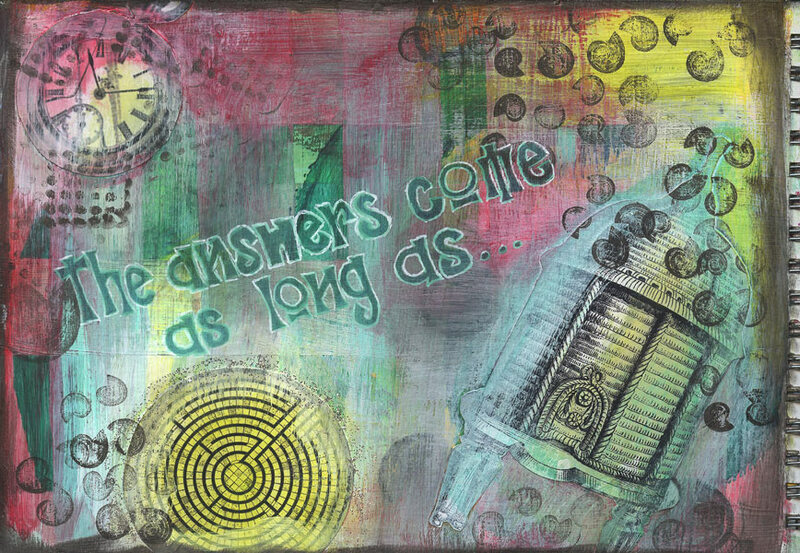 Lots of layers of paper, gesso, acrylic paint and stamping. Oh and I found something to use as a stencil. 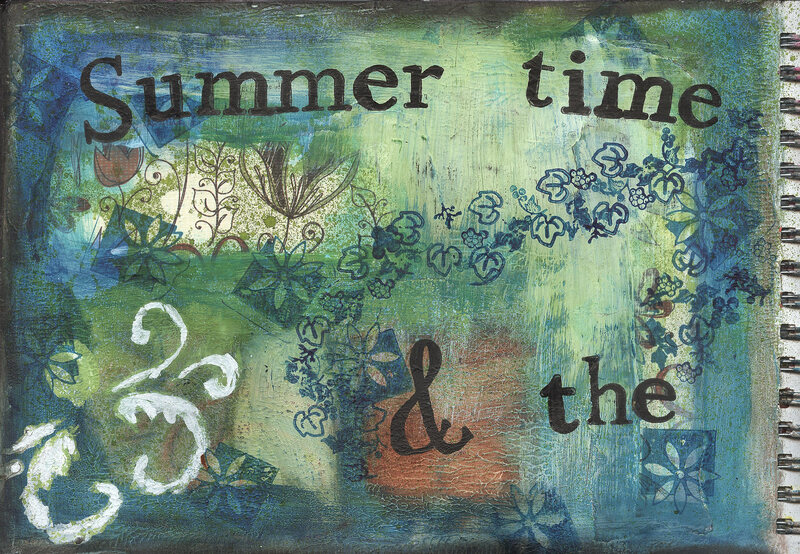 For this spread I used the Wild Plum and Cranberry sprays and the Papermania Birdsong cut paper as a stencil. I really made a horrible mess on the page, just a big purple splodge, nothing pretty about it at all. So to try and retrieve it I cut some of the paper I had used as the stencil and collaged it on top. 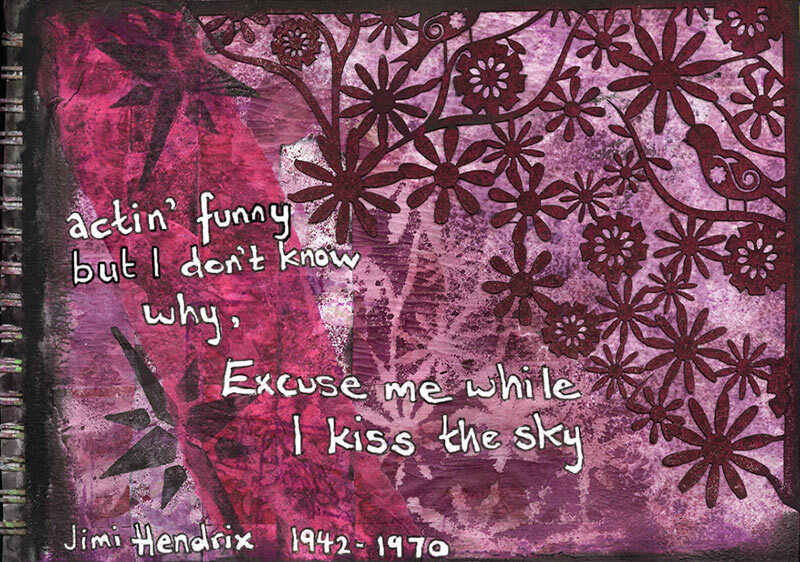 The purple colour made me think of Purple Haze and Jimi Hendrix so I found a picture of Jimi and collaged it onto the page and I tore some pink tissue paper to collage over the top of that. I used a really cheap, in fact it may have been free, foam craft stamp of a star, and then I wrote one of the verses from the song in white to finish it off. … when I was 15 years old I saw Jimi Hendrix play live at the Isle of Wight Festival just a few weeks before his tragic death at the age of 27. I was at that massive festival (about 65,000 people) on my own! I think my brother, who was 17, and I lied to my parents and said we were going together, but of course he really didn’t want his baby sister hanging around and cramping his style. So there I was wide eyed and innocent and all on my own. My mum would have had a fit if she had known! Anyway I came to no harm and I was close to the stage when Jimi was playing. Always when I hear the opening riff of Purple Haze it takes me back to my youth. Around about that time I met and fell in love with a boy, my soul mate – I still love him today.